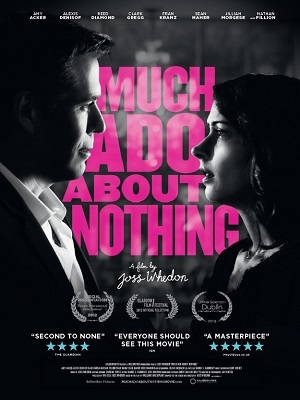 Okay, I was going to wax Buffy for a few weeks but I am way too excited about the fact that Joss Whedon’s Much Ado About Nothing opens today. When I got wind of this project, the cinephile in me perked up, the actor Shakespeare snob in me perked way up, and the fangirl in me made a lot of squee sounds. Whedonites everywhere audibly gasped when we got wind of this project. Here were the facts we had going into tonight’s opening. . .
Joss Whedon is a master storyteller. He has proven he can stand on his own two writing feet and he’s proven he can adapt the hell out of something. Joss Whedon is, at the very least, High Priest of Geekdom (with probably a lot of folks proclaiming him the prince first in line for the throne and many others just calling him King Joss). Fans were peeing themselves over The Avengers and skeptics (aka people who had no idea who he was) were quickly silenced by the awesome. Shakespeare is, quite easily, one of the greatest playwrights to have ever lived and breathed. People who love Shakespeare are usually exceptionally geeky. Combine 1-3 and there can be nothing but magic. Add into the mix Joss calling in a lot of friends and favors on this and you’ve got a recipe for success. These are actors who love working with him and he loves to work with. The preview is full of actors from his shows over the years who have had success (and are extremely talented) but who are not necessarily household names or your typical leading ladies and men. I can’t wait to see them all on the big screen. I love the soundtrack used over the preview. This is going to be awesome, y’all. Can’t wait ’til it hits Chicago theatres!